I so can't believe it is July already. Wow. Where did 6 months go?? I am going to enjoy the summer because I know it is going to fly by! 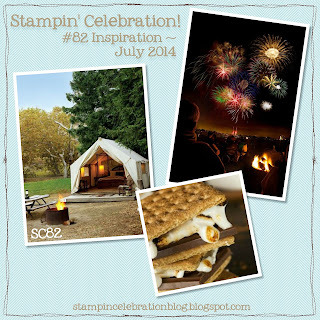 This months Stampin Celebration Inspiration Challenge was really fun! So many ideas, so little time. This challenge came just as I received a new stamp set in the mail from Stampin' Up, Kinda Eclectic. Such great images! As for color, the first color I wanted to use was the new kraft paper as well as the In Colors, especially Mossy Meadow! I am still loving the new In Colors! Here is what I ended up designing! I used Hello Honey, Mossy Meadow and Blackberry Bliss for this card and treat container. I was only going to make the card, but when I cut the kraft paper, I had a 4x6 piece of paper and decided to make the treat container too. What better than to give a coordinated treat along with a card?! I even got to use the new Fast Fuse for the treat container. I recommend watching the video Stampin Up produced about the Fast Fuse tape runner. It's on YouTube and a much watch to learn the simple trick to getting a clean break to the fast fuse adhesive ;0). My first attempt was a bit messy because I didn't watch the video. For the leaves on the card I stamped the image twice before reinking to get the lighter shade of green. For the treat container, I stamped the leaves onto the kraft paper (before adhering the container together mind you). Then I stamped the leaves onto Mossy Meadow cardstock and fussy cut them out (very carefully). I glued the leaves on the treat container (after it was adhered together so I could better place them and so some of the leaves could stick out a little). The butterfly (for both the treat container and the card) was stamped using Blackberry Bliss onto kraft paper and then punched out using the small butterfly punch. For the greeting on the card I added some of the new Venetian Crochet Trim at the bottom along with a strip of Hello Honey cardstock. The treat container greeting is trimmed with the Hello Honey Satin Stitched Ribbon and Linen Thread. The receiver of these will be sure to enjoy the gratitude! Hope you enjoy this month's Inspiration Challenge! The projects from the Design Team are just gorgeous.